Maureen & Jeremy cutting their wedding cake. 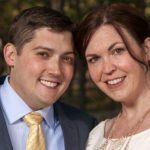 We’re Maureen Thomson and Jeremy Myers and we’re the husband and wife team behind Blue Sky Elopements. We’re drawn to couples that steer clear of the big wedding hoopla in favor of a small wedding experience. We’re right there with ya! 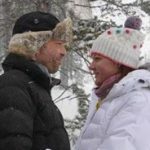 We had our own elopement-style wedding in 2007–an intimate gathering of 10 guests on a crystal clear, snowy Colorado December evening–outdoors–surrounded by a gazillion white lights. It was absolutely magical. We had our cake and Champagne with our guests BEFORE the ceremony (an unintentional symbol of our “Eat Dessert First” philosophy?). Then after we were married, we rode off in a horse-drawn carriage to a private dinner for two. We began our wedding careers as an officiant (Maureen) and photographer (Jeremy). 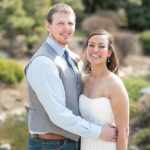 When planning our own intimate wedding, we realized how difficult it was to find quality wedding professionals that were interested in working small weddings. We knew if we were having that problem, so were many other couples. 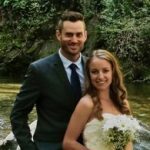 Blue Sky Elopements was founded in order to give eloping couples access to the same topnotch wedding professionals that “big wedding” couples come to expect. 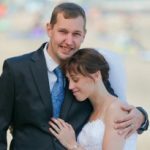 In addition, we wanted to put our extensive experience to work for eloping couples so they wouldn’t have to stress about anything for their wedding day. 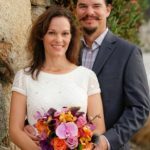 After some trial and error, our all-inclusive small wedding packages were born! We vigorously pre-screen all of the wedding professionals that work for us. Only 20% of vendors that apply to work for us are accepted. They must demonstrate excellence in their chosen craft along with a commitment to providing topnotch customer service and timely communication. All of the professional wedding services our couples want are bundled under one umbrella and capped off with our exclusive Location Consulting Service (to help couples find the perfect-for-them outdoor wedding venue). Then we provide each couple with a personal coordinator who serves as their go-to person from start to finish. To focus exclusively on the small-wedding experience we limit the size of our wedding to 30 guests. It’s all about running a super-tight ship (Maureen’s specialty! )–providing a stress-free, drama-free and smooth-as-silk wedding day experience for our couples. We want your wedding to be as joy-filled and fun as ours was. We know firsthand the joy of getting married in such a way that you’re actually enjoying the experience; focusing on each other rather than getting twitterpated about bridesmaids dresses, seating charts and a ton of other details that have nothing to do with your relationship. If this sounds like you, then we'd love to share the benefit of our experience and expertise. We package any and all of the professional wedding services you're seeking.